Since the publication of the first edition, the U.S. Surgeon General released the first-ever report on bone health and osteoporosis in October 2004. This report focuses even more attention on the devastating impact osteoporosis has on millions of lives. According to the National Osteoporosis Foundation, 2 million American men have osteoporosis, and another 12 million are at risk for this disease. Yet despite the large number of men affected, the lack of awareness by doctors and their patients puts men at a higher risk that the condition may go undiagnosed and untreated. It is estimated that one-fifth to one-third of all hip fractures occur in men. This second edition brings on board John Bilezikian and Dirk Vanderschueren as editors with Eric Orwoll. The table of contents is more than doubling with 58 planned chapters. The format is larger – 8.5 x 11. 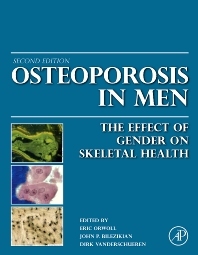 This edition of Osteoporosis in Men brings together even more eminent investigators and clinicians to interpret developments in this growing field, and describe state-of-the-art research as well as practical approaches to diagnosis, prevention and therapy. John P. Bilezikian, MD, the Dorothy L. and Daniel H. Silberberg Professor of Medicine and Professor of Pharmacology at the College of Physicians & Surgeons, Columbia University is Chief of the Division of Endocrinology and Director of the Metabolic Bone Diseases Program at Columbia University Medical Center. Dr. Bilezikian received his undergraduate training at Harvard College and his medical training at the College of Physicians & Surgeons. He completed four years of house staff training (internship, residency and Chief Residency) on the Medical Service at Columbia Presbyterian Medical Center. Dr. Bilezikian received his training in Metabolic Bone Diseases and in Endocrinology at the NIH in the Mineral Metabolism Branch under the tutelage of Dr. Gerald Aurbach. Dr. Bilezikian belongs to a number of professional societies including the American Society for Bone and Mineral Research, of which he served as President, 1995-1996 and the International Society of Clinical Densitometry, of which he served as President, 1999-2001. He serves on the Board of Governors of the International Osteoporosis Foundation (1998-present) and on its Committee of Scientific Advisors (2001-present). He is Chair of the Endocrine Fellows Foundation. He served as Editor-in-Chief of the Journal of Clinical Endocrinology and Metabolism (2000-2004) and as Senior Associate Editor of the Journal of Bone and Mineral Research (2008-2012). He is Executive Advisory Editor of Bone Research (2013-present). His books include Editor-in-Chief of The Parathyroids [1994, 2001, 2014], and co-editor of The Aging Skeleton (1999), Dynamics of Bone and Cartilage Metabolism (1999, 2006), Principles of Bone Biology (1996, 2002, 2008) and Osteoporosis in Men (2010). He served as co-chair of the last three NIH Workshops on Primary Hyperparathyroidism (2002, 2008, 2013). He is the recipient of the Distinguished Physician Award of the Endocrine Society, the Frederic C. Bartter Award of the American Society for Bone and Mineral Research (ASBMR) for Excellence in Clinical Research and the First Annual Global Leadership Award of the International Society of Clinical Densitometry. In 2009, he received the Gideon A. Rodan Excellence in Mentorship Award from the ASBMR. He received the Laureate Distinguished Educator Award of The Endocrine Society in 2014. In 2014, he was made honorary member of the Brazilian Society of Endocrinology and Metabolism. His publications number over 700. Columbia University, New York, New York, U.S.A.